Last year I featured on the blog some pretty little pistachio scones for Mothering Sunday. Only problem was my own Mum was at home in Spain at the time, so she didn’t actually get to sample them until she got around to baking a batch for herself from my recipe. When Mum was over from Spain last weekend, I baked a super squidgy malt loaf which she really, really enjoyed, and so it feels appropriate this is the recipe I post this year as my Mother’s Day offering. One I’ve actually managed to bake for my own mother. I found myself reminiscing about malt loaf a few weeks ago, wondering how a homemade version would compare to shop-bought. Sometimes there’s no point messing with something you already love. But I figured with malt loaf there was potential, and it turns out I was right. 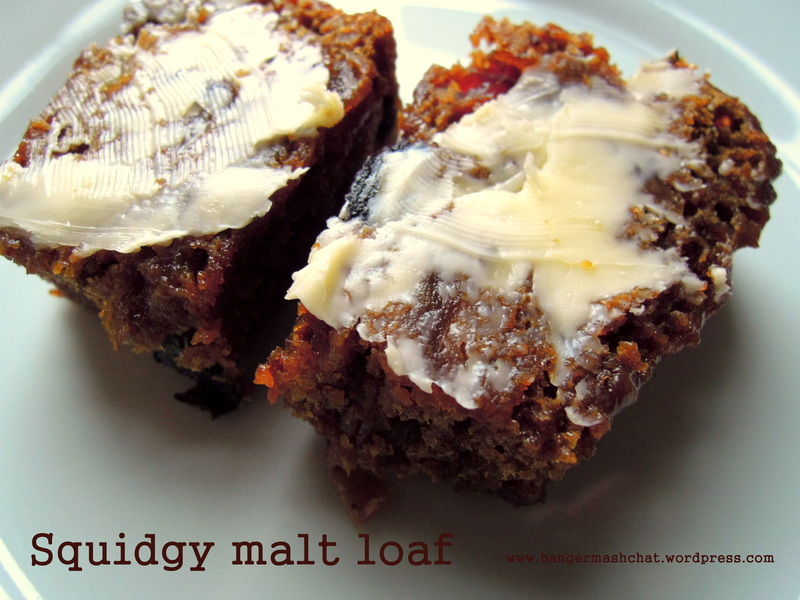 You can add loads more fruit to a malt loaf you bake yourself (I majored with big, fat pieces of gooey dried fig but you can go with whatever you fancy) and you can up the sticky-squidgy levels with lashings of malt extract and treacle. The children ate theirs as it came, but Mum and I enjoyed ours with a thick spread of butter. Heavenly. Preheat the oven to 150°C/gas mark 2. Grease and line a 450g/1lb loaf tin with baking paper. In a large bowl, mix the hot tea with the malt extract, black treacle, demerara sugar, sultanas, figs, cranberries and blueberries. Next add the egg and combine well. Add the flour, baking powder and bicarbonate of soda and mix thoroughly. Pour into the loaf tin and bake for around 50 minutes until fairly firm and slightly risen. Leave to cool a little on a wire rack for 10 minutes and then brush the top with a little more malt extract. Then leave to cool completely before removing from the tin. Store in an airtight container for up to five days. 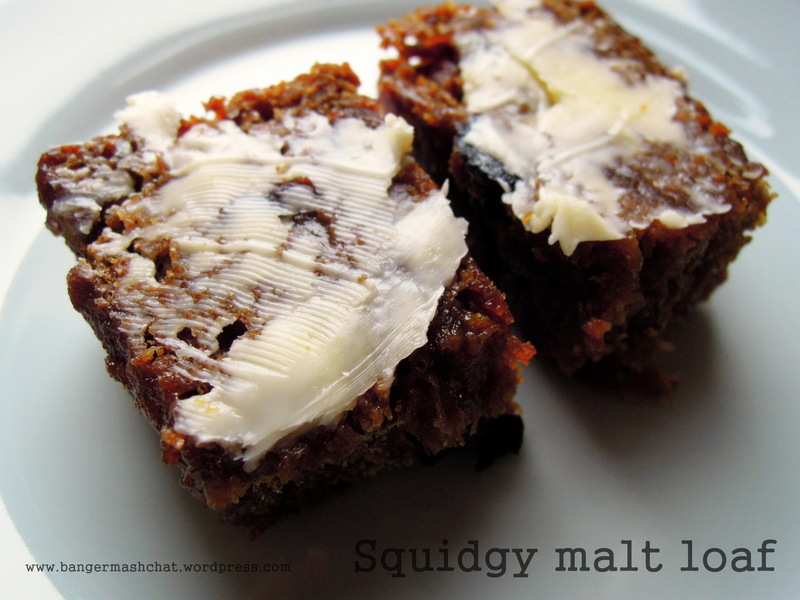 The malt loaf will get progressively stickier and squidgier. If it lasts that long before getting gobbled up. Oh I’m so going to bake this. Looks totally lush and packed full of fruity goodies! Absolutely. And I was so pleased my own mother liked it too. Apparently she’s been raving about it to all her work colleagues back in Spain. I’ve been ordered to send her some malt extract as she can’t get hold of it over there! Next time I’m in the UK I shall definitely be purchasing some malt extract for this very loaf! Can’t wait to try. I remember the shop bought malt loaf – we used to have a slice when we got back home hungry after school! Your version looks way better though – another one to put on my ‘to bake’ list. I made this a few weeks ago for Mother’s Day and it was wonderful! I used half treacle and half golden syrup and wow, thanks for sharing the recipe! Just bought a load of malt extract in Aldi, they get it in Lidl sometimes too, in Spain. March’s Recipes for Life challenge: what can you do with beetroot, carrot and cheese?